↑ 1.0 1.1 BirdLife International (2012). "Grus antigone". IUCN Red List of Threatened Species. Version 2013.2. International Union for Conservation of Nature. http://www.iucnredlist.org/apps/redlist/details/22692064। আহৰণ কৰা হৈছে: 26 November 2013. ↑ Blanford, W.T (1896). "A note on the two sarus cranes of the Indian region". Ibis খণ্ড 2: 135–136. doi:10.1111/j.1474-919X.1896.tb06980.x. ↑ ৰেজা খান (২০০৮). বাংলাদেশেৰ পাখি. প্ৰকাশক ঢাকা: বাংলা একাডেমী. পৃষ্ঠা. ১৫২. ISBN 9840746901. ↑ 4.0 4.1 4.2 জিয়া উদ্দিন আহমেদ (সম্পা.) (২০০৯). বাংলাদেশ উদ্ভিদ ও প্ৰাণী জ্ঞানকোষ: পাখি, খণ্ড: ২৬. প্ৰকাশক ঢাকা: বাংলাদেশ এছিয়াটিক ছছাইটি. পৃষ্ঠা. ১৪৯. ↑ Vyas, Rakesh (2002). 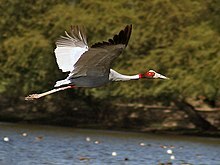 "Status of Sarus Crane Grus antigone antigone in Rajasthan and its ecological requirements". Zoos' Print Journal খণ্ড 17 (2): 691–695. http://www.zoosprint.org/ZooPrintJournal/2002/February/691-695.pdf. ↑ Wood, T.C. & Krajewsky, C (1996). "Mitochondrial DNA sequence variation among the subspecies of Sarus Crane (Grus antigone)" (PDF). The Auk খণ্ড 113 (3): 655–663. doi:10.2307/4088986. http://sora.unm.edu/sites/default/files/journals/auk/v113n03/p0655-p0663.pdf. ↑ "Sarus Crane Grus antigone". BirdLife International. http://www.birdlife.org/datazone/speciesfactsheet.php?id=2787। আহৰণ কৰা হৈছে: 2013-08-02.